Lily Kunin from Clean Food Dirty City creates plant-based recipes that do the body good. Her collection highlights the versatility of vegetables and she finds ingenious ways to incorporate them in your everyday diet. 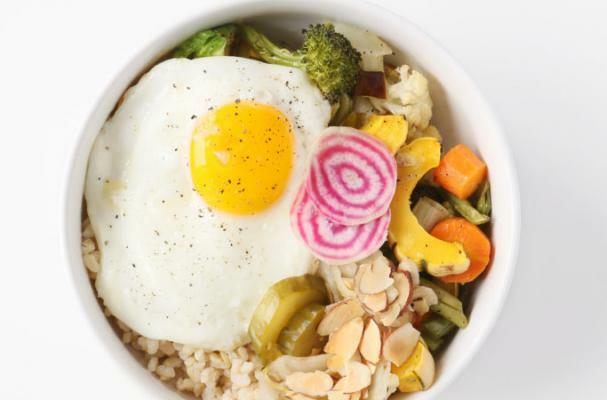 This fresh market bowl is a flexible meal that can be prepared with whatever is in season. I am constantly inspired by the offereings at my local farmer's market so that would be a great place to start. This give you an outline so run with it and let us know what you come up with on your own. Step 1: For the almond-tamari sauce: Combine all ingredients together in a small mixing bowl. Add 1/4 cup of warm water as you whisk ingredients together. Continue to add warm water, 1 tablespoon at a time, until you reach your desired consistency (it should be pourable but slightly thick). Step 2: For the market bowls: Preheat the oven to 400°F. Line a baking sheet with parchment paper and set aside. Prep vegetables to be about the same size so they cook evenly. Toss with oil, salt and pepper. Spread evenly in a single layer on the sheet pan and roast for 30 to 35 minutes, until they are browned and tender, depending on the size of your vegetables. Remove the vegetables and turn the oven down to 375°F. Add some butter (or ghee) to an oven-safe nonstick or cast iron pan. Crack in the eggs (as many that can fit at one time) and cook until the whites turn opaque. You can simply flip them for an over easy or over medium egg, or place pan into oven for an additional 3 to 4 minutes, until the whites are fully set. Divide the brown rice and vegetables between 4 bowls. Top each with 2 tablespoons kimchi, a fried egg, 1 tablespoon sliced almonds, and about ¼ cup almond-tamari sauce.